New car sales were down slightly in September, but only in comparison with September 2015, which turned out to be an exceptional month at U.S. car dealers. Sales totaled around 1.4 million units, down about 2% from last year but still on a healthy pace. But that's a good thing, when it comes to consumers. 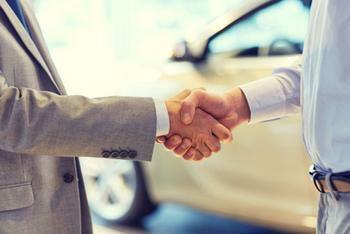 People shopping for a new car are able to get low-or-no interest financing and cash back. In September, some auto manufacturers did better than others. Hyundai-Kia reported record September sales. Hyundai dealers reported strong sales of the Santa Fe and Santa Fe Sport, in addition to the sub-compact Accent, combining to boost sales 4% above September 2015. It was a similar story at Kia, which reports sales in the first nine months of the year were the best ever. "On the strength of double digit gains for the Rio, Forte, Sportage and Sedona nameplates through the first nine months of the year, Kia's upward trajectory continues despite the industry showing signs of little growth," said Michael Sprague, chief operating officer at Kia Motors of America. But overall sales were down at Fiat-Chrysler, which reported selling 192,883 cars and trucks during the month. Despite the overall drop in sales, Ram Truck sales surged 27% over last year, as more consumers decided low gasoline prices might be around for a while longer. Fiat-Chrysler also got double-digit sales increases from the Dodge Charger, Dodge Challenger, Jeep Grand Cherokee, and Chrysler Pacifica. But the Pacifica was the exception, as Chrysler brand sales were down 27%. For consumers looking for bargains, considering a model that dealers are having a hard time moving off the lot will provide the best opportunity. Instead, Moody suggests taking a look at sedans, which have fallen out of favor over the last couple of years. “Dealers may be anxious to move even typically great cars like Accord, Camry, Fusion, Impala and Passat,” he said. What are parents searching for in a family vehicle?